Kizlarkhon Dusmuhamedova - "Queen of All the Girls"
Washington, DC – Exuberant dances, lavish costumes, and ancient traditions will entertain audiences at the Silk Road Dance Festival on November 19, 2011, at Joe's Movement Emporium in Mount Rainier. Inspired by the Silk Road theme of the 2002 Smithsonian Folk Festival, the event focuses on the rich diversity of dance found along the celebrated trade route that connected China with the Mediterranean. Daytime activities include dance workshops for adults and children, a Central Asian style "chaikhona" (teahouse), a lecture on Uzbek traditions and a Silk Road bazaar. The festival culminates in an evening concert at 8 pm featuring guest artists from India, Central Asia, and China along with the award-winning Silk Road Dance Company. Dance workshops in Uzbek, Azerbaijani, Persian, and Kathak styles will be offered at Joe’s Movement Emporium from November 18th to 20th, as part of the 14th Central Asian Dance Camp. Audiences can enjoy these and other pieces in the Saturday night concert that will highlight the Silk Road Dance Festival. Rare and compelling choreographies of Afghan, Azerbaijani, Chinese, Indian, Kazakh, Persian, Tajik, Turkmen, and Uzbek origin will provide a glimpse into cultures unfamiliar to most Americans. Featured artists include Jayantee Paine Ganguly, director of Konark Dance School and Jayantika Dance Company, who will perform classical Indian Kathak dance. The Xuejuan Performance Ensemble, a Chinese dance company directed by Xuejuan Feng - a graduate of the Beijing Dance Academy – will present group and solo pieces. Traditional and classical dances of the Uzbek, and Tajik people will be performed by guest artists and the award-winning Silk Road Dance Company. Co-presenters of the Silk Road Dance Festival include the Asia Heritage Foundation, the Uzbek Dance and Culture Society, and World Arts Focus. Special assistance from the Embassy of the Republic of Uzbekistan will give provide a taste of traditional Uzbek cuisine. 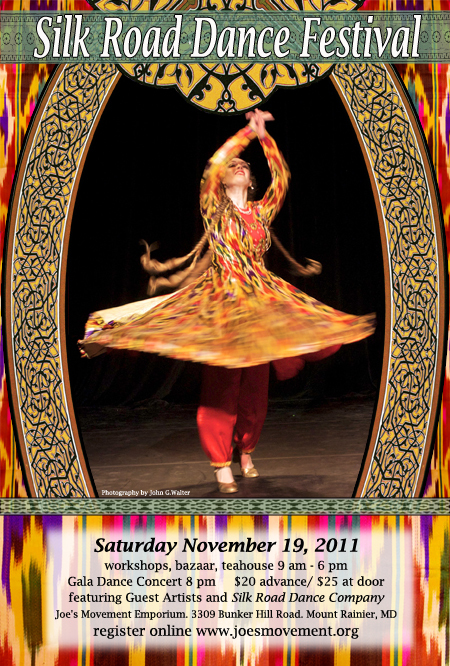 For more information on the Silk Road Dance Festival, check it out on Facebook! A Maryland nonprofit corporation and a 501(c)3 exempt tax non-profit organization. The contents of this website, including all text and images, are protected and may not be used without the express written permission of Silk Road Dance Company®. Copyright 2013, Silk Road Dance Company ®. All rights reserved.